How time flies! It’s been a month since I last posted on this blog. Blogging took a backseat again when I was stopped for a couple of weeks by complaints from my body. There was a need to purge accumulated debris from unwise decisions I had made through the years – eating bad food, taking unhealthy drinks, and a lifestyle that focused on rushing instead of living. When life dishes out interruptions to routines, it is trying to say something to us humans who are forever running around in circles. My journal holds the details of my current trip down the slow lane of dis-ease, as well as the fine lessons learned during the down-time. But journaling too, took a back seat for many days, when the body simply refused to budge and hungrily took all the rest it had been starved of. During those days, I wondered if hard-core writers and bloggers – those who steadfastly keep a routine of daily writing – wrote during times of illness. Did they struggle against the already struggle-weary body? The body is an extremely well-engineered piece of work, and it rewards us when we are good. I got my reward after a couple of weeks, and one day, there it was again – the energy to wake up in the morning and dance with whatever appeared on my door. I was able to go back to my therapy work, do house chores, re-bond with relatives whom we haven’t seen for many years because they live in the U.S., watch TV, and enjoy life again. Still, I didn’t go back to blogging. It was hard to go back to blogging because I hadn’t established blogging regularly as a habit – although I was beginning to get the hang of it when dis-ease came knocking. Every morning when I checked my email, I was always surprised by several notifications of new followers for this blog. This blog to date has over a thousand followers since April of last year – and it is always a pleasant surprise to read notifications of new followers. And the truth is, that is one of the reasons why I am posting again. The other reason is this: yesterday I chanced upon an article about the French journalist, Jean-Dominique Baub, who suffered a massive stroke that resulted in a condition called locked in syndrome (LIS). LIS Leaves the patient with complete paralysis of almost all of the body’s voluntary muscles except for the eyes. Jean-Dominique Bauby’s story is a source of inspiration for writers and bloggers, especially those like me who find all sorts of reasons not to blog or write. It’s not only inspiring, but downright embarrassing to find out that Bauby persisted in writing despite all odds; and here I am attributing procrastination to a short-term and just slightly debilitating dis-ease. How did he do it? Bauby used partner assisted scanning. Through this communication technique, he was able to recount his life before and after the stroke in his memoir entitled, “The Diving Bell and the Butterfly” (original French title: Le Scaphandre et le Papillon). The transcriber recited a French language frequency-ordered alphabet (E, S, A, R, I, N, T, U, L, etc.) and a blink from Bauby meant he had chosen the letter and was thus a signal to the transcriber that he was moving on to the next letter. How long did it take Bauby to write his memoir? Working four hours a day, it took him 200,000 blinks and ten months, meaning that a word took approximately two minutes to write. Sadly, Jean -Dominique Bauby died of pneumonia on March 9, 1997, three days after his book was published. He leaves us with a most important lesson: Nothing can keep us from writing; but no one can give us the impetus to write except ourselves. Bauby deserves much applause and praise, and after giving him that, it’s time to turn the focus to us blogger and writers who are still taking our sweet time to take our writing and blogging skills to the next level. How do we do that? Do we have to wait for something catastrophic to happen to push us to be the best of who and what we are? How can we find the fierce determination to blog and write? Last year, I joined more than 200 people who tackled a 2-manuscript pages a day writing challenge that guaranteed we would have written the first draft of a book in four months. I thought that the combined energy of more than 200 people would help spur the writer in me to finish a first draft, but I found myself losing steam in the second month. By the third month I had completely forgotten about the challenge, as did many others. The network that sponsored the challenge began another challenge, but this time the participants were required to write one page a day only. I did not even bother to sign up for that one because I knew I wouldn’t finish it either. Like most of you, I am not lacking in ideas about what to write or blog about. But like many of you, I have not found my bearing. When I worked as a journalist, it was easy to write because I had deadlines, and a paycheck rewarded me for my efforts. This is one issue I will be trying to explore more in forthcoming blog posts, but I would certainly welcome any suggestions now. I write everyday, usually a blog post and working on my novel. Sometimes just one or the other. But when I was ill a couple of weeks ago, I stopped. I still wanted to write. I still sat down to write, but I was so worn out from being ill that my brain just wasn’t thinking. I just didn’t have any words. I guess writers block caused by being ill, but with my novel I already had the ideas. I just couldn’t seem to form coherent sentences. So I think it’s different for everyone. You’re right, it’s different for everyone. I hope you’re feeling better now, and that you’ll be able to finish your novel soon. Perhaps when we know the illness will pass, we can be kinder to ourselves and allow writer’s block to set in for a while. Thank you for sharing your experience. Thank you for reminding me about this fact – yes, indeed, when something becomes a chore, it stops being a fun activity…. I should look for the fun in blogging…. I’ve been writing unfinished stories for a long time, problem is not timing its simply finding the courage to move forward as well as having the writers block. so I’ve just started blogging as a newbie, hoping to get some inspiration and courage to actually put pen to paper. Alysia, you’re not alone. I have unfinished articles which I had hoped would turn into books. Can’t get over the doubting phase yet…..Welcome to blogging. It helps exercise the writing muscles. Good luck with your writing! I really, really loved this post, Rosanne. Jean-Dominique Bauby’s story goes to show that where there’s a will there’s a way. And for some, writing is more of a compulsion than a means to an end such as getting a book or article published. A friend of mine died three years ago. And when her daughter went through her things she was amazed to discover a large box filled with the most beautiful hand-written poetry and short stories. The thing of it is that nobody, not even her daughter, knew that the deceased had ever put a pen to paper other than to write the odd letter. Glad you liked the post, Cecil. What a wonderful legacy your friend’s daughter has left behind. I hope your friend will be able to make something out of the poems and short stories left behind by her daughter. 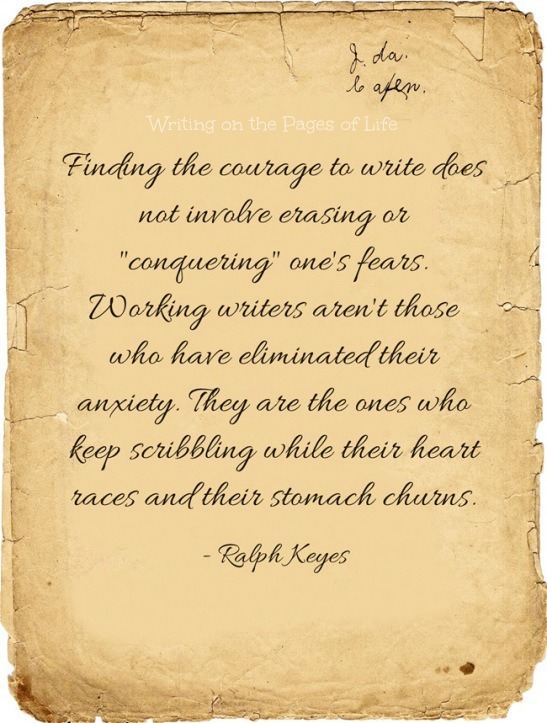 How I wish writers who have a compulsion for writing can pass on the excess energy to those of us who seem to be wanting in courage and confidence! This post gave me all the motivation to keep blogging, especially the story about Baub. His story was inspiration enough. There are absolutely no excuses to not write, especially if your hands and fingers are still working. Thanks for this great post! I agree, there are no excuses not to write…but we are so creative we find ways not to write. At least I am… but we find inspiration and try to make it happen. I like it when you say as long as our hands and fingers are still working, we should write. Hmmm, I’ll tell myself that the next time laziness creeps in. Thanks too! This is just what I needed to read. It applies to so much more than writing. We all need a shot in the arm sometimes, Charnele. How true, Bauby’s story extends beyong writing!